Your Home: Decor Trends ~ What’s In & What’s Out for 2019? Home > Blog > Home > Your Home: Decor Trends ~ What’s In & What’s Out for 2019? As with anything, trends for the home come and go. If you’re curious about what the style-statements are this year and what is now considered passé, read on for some highlights on what you’ll be seeing (and what might be screaming “dated!”). OUT: Although it’s had quite a resurgence since its heyday in the 1970s, the boho, macramé, batik style that’s been popular the last few years is over. Ikat and tribal-patterned textiles and wallpapers are looking tired and old. Instead, look for fresh geometric or floral prints. IN: Dark, sultry bathrooms that evoke a luxurious and indulgent experience are making their way into homes across the Valley. Think richly painted walls in hues of navy, charcoal gray and even black. Dark woods, inky granites and even dark-hued sinks, toilets and bathtubs combine to set a romantic and sumptuous ambiance. OUT: Gray everything. Not that gray is completely out, but the style that that has been so, so popular wherein entire rooms, if not entire homes, are decked out in neutral grays has been so overdone that it’s now finally died off. What’s taking the place of gray? We’re moving back to tones of beiges and browns. IN: Bold kitchen backsplashes. Here is where your sense of individuality and style can pop through in even neutral-toned kitchens. From bright splashes of color, to daring patterns and materials, we’re going to see more and more personality in our kitchens this year. OUT: Letter art. You know, the big and bold words hung on walls and filling up Pinterest boards all over the nation. From “EAT” or “Farmhouse” in the kitchen to “Live, Laugh, Love” in a bedroom, this too is a trend that has hit its peak. IN: Light wood for floors. The rich, dark stains and wood grains have given way to a more open and airy style. Think maple, birch, beech or white oak. Here too, you’ll see more creamy and beigey tones rather than grays. OUT: Accent walls. 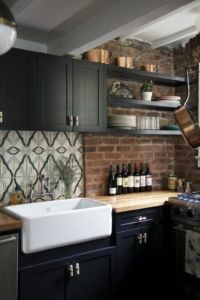 Whether painted a different color than the other walls in the room, or perhaps wallpapered while the other walls aren’t, this trend which has been popular for over a decade is definitely looking dated now.